Metro Hosting is partnering with several premier national Cloud hosting providers to implement the most efficient hosting resources for your application. We manage your Cloud service, starting at only $25 / month, which will cover resources for most small to medium-sized applications. You literally pay per-hour for further memory, CPU, or hard drive space as needed. Cloud hosting with Metro Hosting combines the most efficient cost model along with our proven personalized support! Metro Hosting is a Washington, DC-based provider of dedicated managed servers, custom dedicated servers, affordable dedicated servers, shared hosting and Web applications solutions. We provide a custom approach to your business IT infrastructure and can deliver a specific package to meet your exact needs without going overboard on budget. Our customized approach to your particular hosting requirements is what separates us from the national competition -- and we are offering our services at a highly competitive price! Please provide us with some basic information through our contact form, or call a support representative for a free consultation. 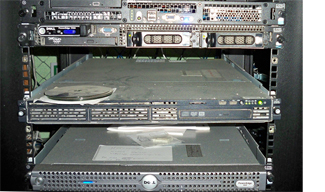 We own our custom dedicated server infrastructure! Metro Hosting has reinvested into owning its own hardware -- a strategic business move that drastically improves our service offerings, response time and naturally the 'bottom line'. We are able to offer customized dedicated servers at competitive pricing, thanks to cutting out the 'mid-level support technicians'! What's the News in Web Technology? Why Does Your Small Business Need a Dedicated Server?